Before I started experimenting with plant dyeing I needed to mordant the yarns I was going to use. I collected all the white and grey coloured wool yarns I could find from my own closets and from the storage room of my childhood home. Some of the yarns where really old. I think that some of the curly ones are from my late aunt’s collections. The yarn might be from a pullover that was unraveled, so it could be made in to new things (everything needed to be saved). 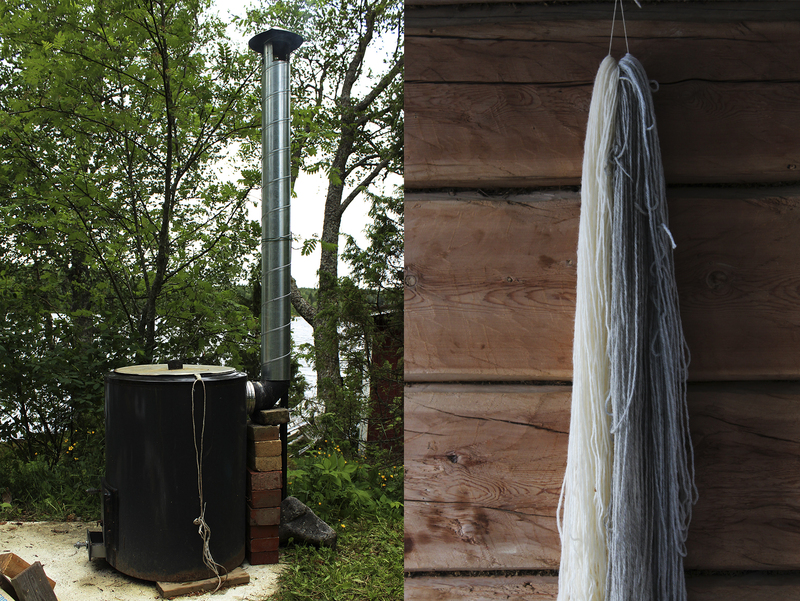 Most of the yarn I used was 100 % wool yarn which is perfect for natural dyeing. Wool and silk absorb natural colour the best. 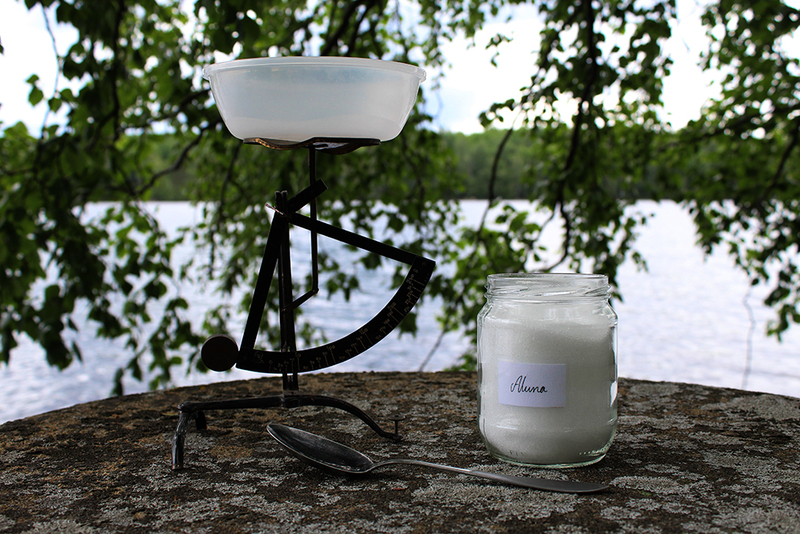 In my experience cotton and linen and more difficult to dye, protein fibers work the best. Do you have any experiences with different materials? 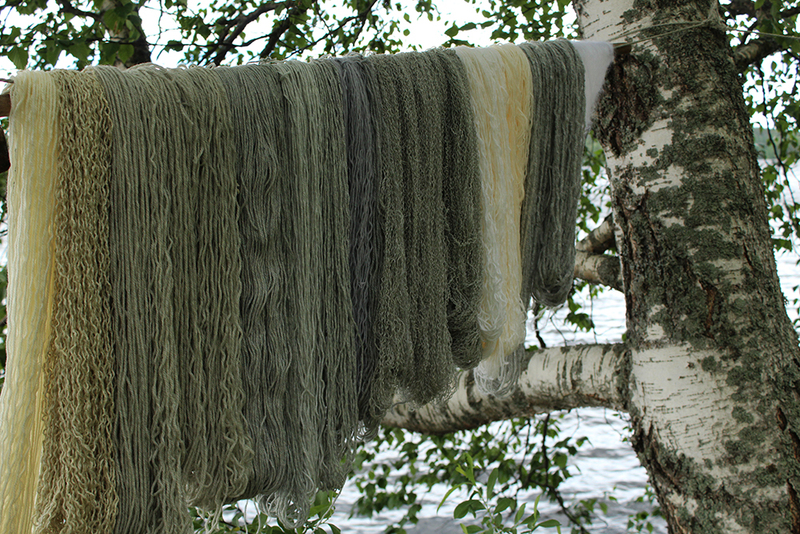 I noticed that there is a huge difference in how different kinds of yarns react to natural dyes. But back to mordanting. 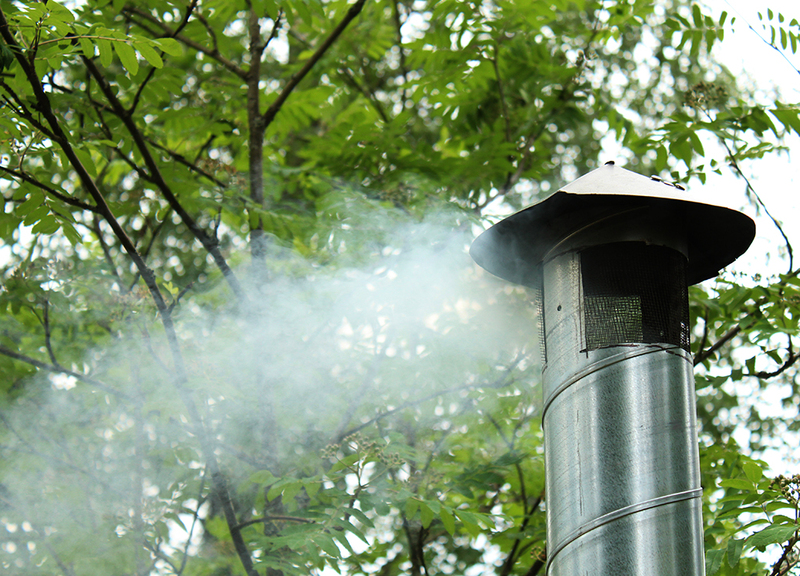 Why is it important to do mordanting? This step is to ensure that the colour will stick to the yarn better and that it will be stronger. I wanted to pre mordant the yarn, because I have heard that the results are better that way. It’s also possible to mordant the yarn at the same time as dyeing it. But I think it is handy to get this step out of the way so I can concentrate into more fun parts of natural dyeing. First I winded the yarn into skeins and tried my best to keep them from tangling too much. 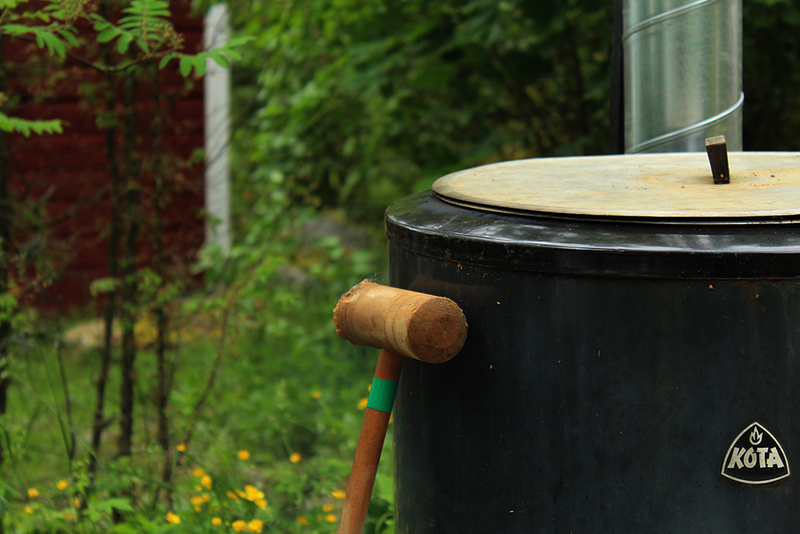 I used this very large pot that we use to boil water at our summer cottage (I’m struggling to find an English word for it). The amount of alum is always around 10% of the weight of the dry yarn. I had 1 kg of yarn so I added 100 g of alum. I let it dissolve into small amount of lukewarm water and then mixed it with the rest of the water. I made a mintage here with the amount of water, it should be 5 litres of water towards 100 g of yarn. I didn’t use enough water but it seemed to work anyway. 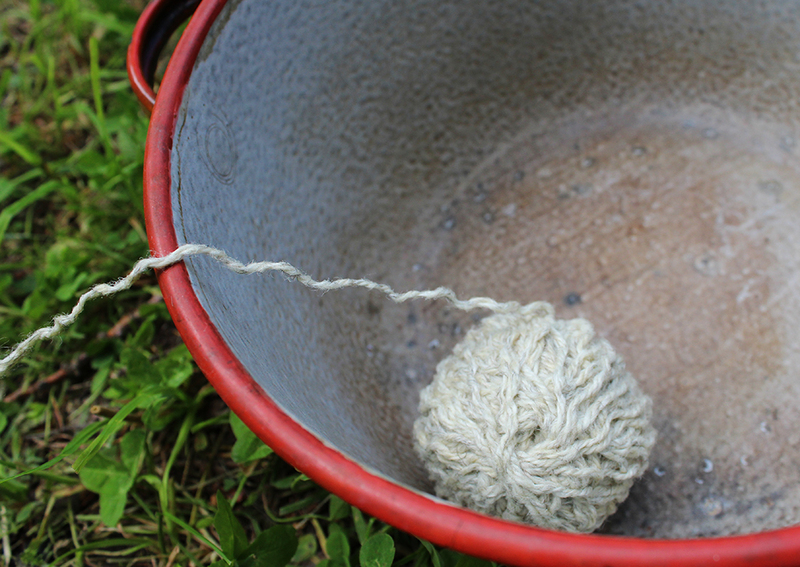 I soaked the yarn in water beforehand so it was wet when I added it into the pot. 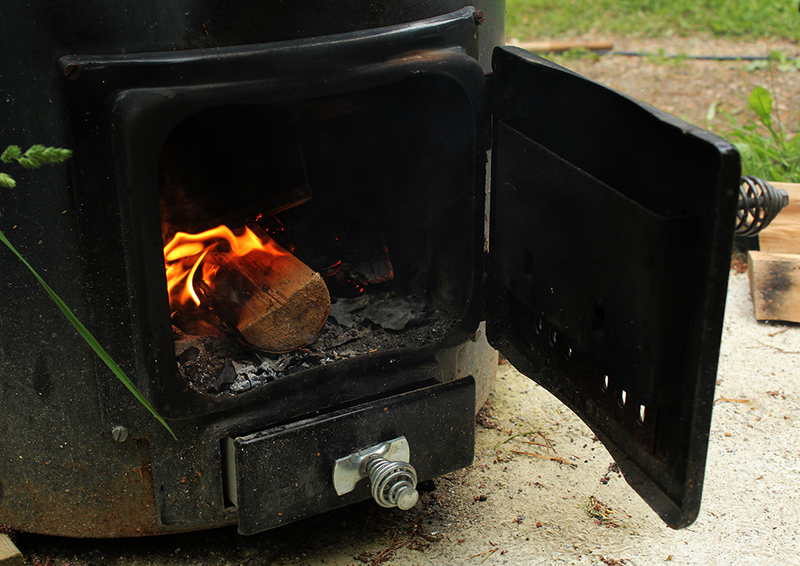 I brought the water to a boil and after that kept the temperature at around 80 °C. Wool yarn does not like to be boiled and boiling can also evaporate the alum into the air when the alum should be absorbed into the yarn. I just checked that the water was not bubbling and let the yarn stay in the pot for one hour. It’s important to stir the yarn every now and then to ensure an even distribution of alum. The weather was as grey as the yarn I was working with and it also started raining, but I got the deed done. I dried the yarn for later use, but I always soak the yarn in water to make sure it’s evenly wet before adding it to the colour liquid, that way the dyeing result is going to be even. There are other things one can use for mordanting than alum, but I like alum because it doesn’t change the colour of the yarn the way iron or copper do. Unless that’s what you want to do. Copper changes the colour into more greenish and iron brownish colour. Later I discovered that many people also use cream of tartar together with alum. Cream of tartar should help the alum dissolve better into the water and to absorb better into the yarn. Live and learn! Next time I’ll do things differently but even so I think my way worked fine as well. Have you got any mordanting experiences? What has worked for you? Ps. 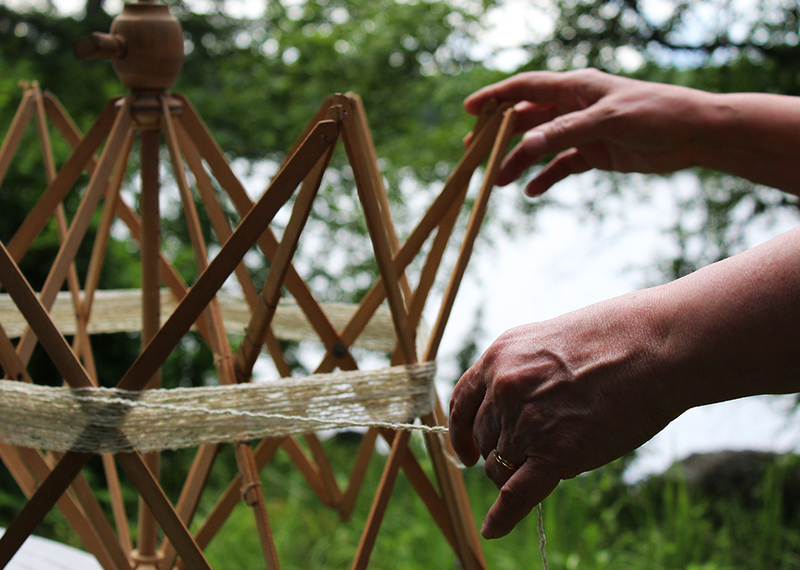 Make sure that the pots and other tools you use for mordanting and dyeing are only for dyeing not for cooking. Cool that you like our water heater. 🙂 I do usually use smaller pots. The reason I used this one was because I didn’t have a big enough pot for all the yarn I had that time. I love your blog and the art you make. 🙂 And same to you thanks for stopping by!